According to Joseph b. Ḥama (Shab. 56b), Nathan de-Ẓuẓita is to be identified with the exilarch 'Uḳban b. Nehemiah, Joseph's contemporary (first half of the 4th cent. ), who was a contrite sinner. The Seder 'Olam Zuṭa, too, in the list of the exilarchs (recension A, Neubauer, "M. J. C." ii. 71), mentions an exilarch called "Nathan 'Uḳban (Nathan de-Ẓuẓita). Rashi (ad loc.) gives two explanations for the surname "Ẓuẓita," which means literally either "sparks" or "hair" (comp. Ezek. viii. 3). Rashi explains that in touching the angel who received his repentance Nathan 'Uḳban either emitted sparks, or the angel took him by the hair. In Sanh. 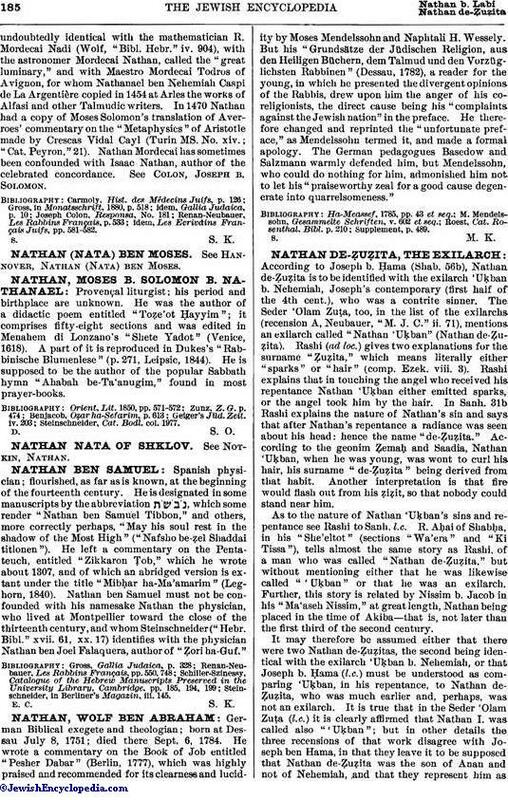 31b Rashi explains the nature of Nathan's sin and says that after Nathan's repentance a radiance was seen about his head: hence the name "de-Ẓuẓita." According to the geonim Ẓemaḥ and Saadia, Nathan 'Uḳban, when he was young, was wont to curl his hair, his surname "de-Ẓuẓita" being derived from that habit. Another interpretation is that fire would flash out from his ẓiẓit, so that nobody could stand near him. As to the nature of Nathan 'Uḳban's sins and repentance see Rashi to Sanh. l.c. R. Aḥai of Shabḥa, in his "She'eltot" (sections "Wa'era" and "Ki Tissa"), tells almost the same story as Rashi, of a man who was called "Nathan de-Ẓuẓita," but without mentioning either that he was likewise called "'Uḳban" or that he was an exilarch. Further, this story is related by Nissim b. Jacob in his "Ma'aseh Nissim," at great length, Nathan being placed in the time of Akiba—that is, not later than the first third of the second century. It may therefore be assumed either that there were two Nathan de-Ẓuẓitas, the second being identical with the exilarch 'Uḳban b. Nehemiah, or that Joseph b. Ḥama. (l.c.) must be understood as comparing 'Uḳban, in his repentance, to Nathan de-Ẓuẓita, who was much earlier and, perhaps, was not an exilarch. It is true that in the Seder 'Olam Zuṭa (l.c.) 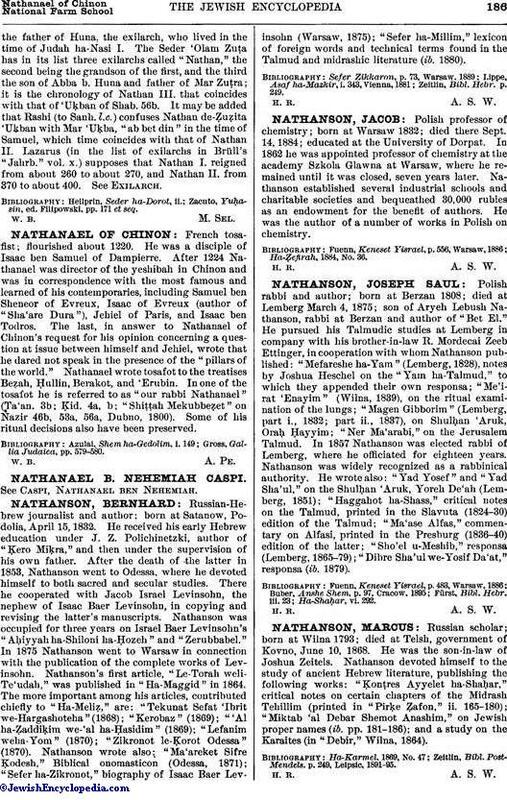 it is clearly affirmed that Nathan I. was called also "'Uḳban"; but in other details the three recensions of that work disagree with Joseph ben Hama, in that they leave it to be supposed that Nathan de-Ẓuẓita was the son of Anan and not of Nehemiah, and that they represent him asthe father of Huna, the exilarch, who lived in the time of Judah ha-Nasi I. The Seder 'Olam Zuṭa has in its list three exilarchs called "Nathan," the second being the grandson of the first, and the third the son of Abba b. Huna and father of Mar Zuṭra; it is the chronology of Nathan III. that coincides with that of 'Utḳban of Shab. 56b. It may be added that Rashi (to Sanh. l.c.) confuses Nathan de-Ẓuẓita 'Uḳban with Mar 'Uḳba, "ab bet din" in the time of Samuel, which time coincides with that of Nathan II. Lazarus (in the list of exilarchs in Brüll's "Jahrb." vol. x.) supposes that Nathan I. reigned from about 260 to about 270, and Nathan II. from 370 to about 400. See Exilarch. Zacuto, Yuḥasin, ed. Filipowski, pp. 171 et seq.